While lacking large animals, the landscapes of the Devonian saw incredible changes in only about fifty million years. Plant life greened once-barren land for the first time. Any plant whose structure promoted capillary attraction or other means to pull moisture and minerals from the moist soil could survive inland, away from rivers. 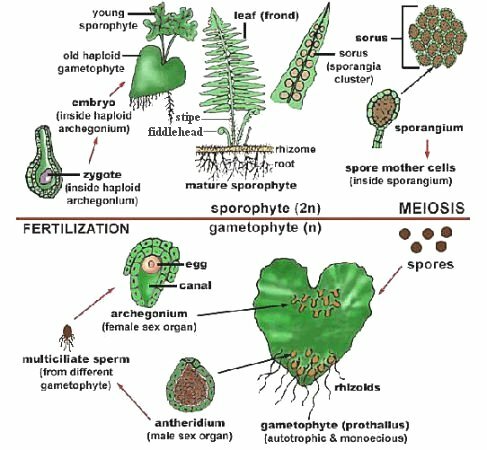 Plants with root-like systems were thus favored, and the root systems evolved rapidly. Also quick to appear were so-called vascular systems: systems of cells that transmit moisture up the stalk of the plant. The more surface area exposed to the sun; the more photosynthesis occurred. Evolution favored specialized organs to expose surface area to the sun: leaves. Plants need sunlight. The taller the plant, the better the chance of getting out of the shade of other plants. Taller plants needed stronger stems. 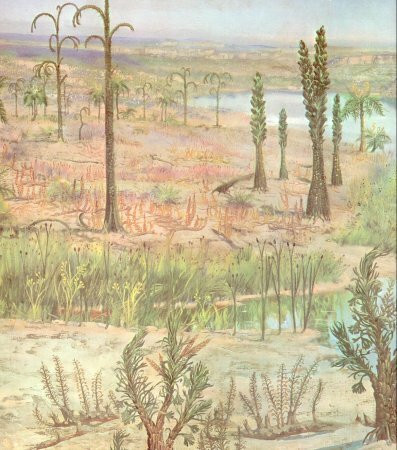 The earliest stiff-stalked and woody plants appeared around 400 MYA. Stiffness enabled plants to grow vertically and stand taller in the air. one type of seedless plant that has survived since the Devonian. 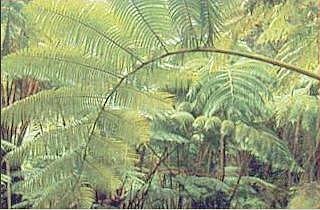 The giant tree fern is still common in tropical regions such as the prehistoric-looking landscapes of Hawaii Volcanoes National Park. 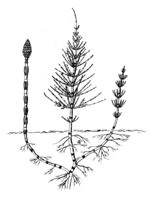 Figure 16 depicts the horsetails, club mosses, and ferns, which were the most characteristic plants of middle Devonian times, although primitive plants such as Psilophytales still survived. The various kinds of club moss included Protolepidodendron, a tall plant with bent branches, and the stumpy Barrandeina with its three branches. Less than 100 million years after the first mass extinction, another occurs around 365 MYA. As before, it seems related to climate change and reduces the number of species by half.